In the Microsoft Windows operating system the user can customize the design of various components of the "Desktop" in accordance with their preferences. 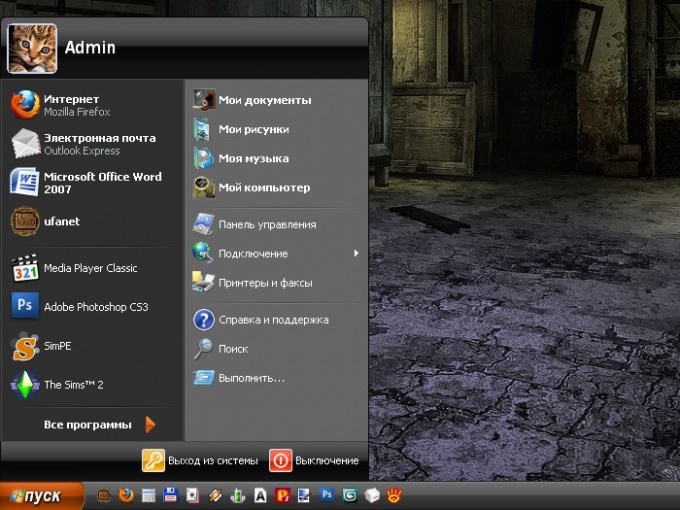 You can change not only the look of the icons, size of labels, but also the color of the "taskbar" and "start menu". To set up eye-pleasing color scheme, you must perform several actions. All settings which are necessary for the user to change the color of the "start menu", "task Pane" or window headers, located in window "Properties: the Screen". This dialog box can be activated in several ways. First: click the right mouse button in any empty space on "Desktop". From the drop-down menu, select "Properties", clicking on it with the left mouse button. Alternatively, through the menu "start", go to "control Panel". In the category "appearance and themes" select any of the jobs or click the left mouse button on the icon "Display". If "control Panel" is in classic view, click the icon immediately. To switch from classic view to category view and back, if you click on the appropriate line command in the left part of the window "control Panel". In the dialog box "display Properties" click the tab "Themes". Change the color of the "start menu" happens when you change themes Desktop. Using the drop-down menu under "Subject" select the option that you like. If you want to install a custom theme, select from the drop down list select "Browse" and specify the directory where you saved your favorite topic. Go to the tab "appearance". Under "Windows and buttons" select the color for opened folders, Windows applications, "taskbar" and "start menu" using the drop-down list. Some patterns have different color schemes. To view them, and select what you want, use the drop down list under "Color scheme". Once done selecting, click on the "Apply" button for the new settings took effect. Close the properties window by clicking the OK button or the X icon in the upper right corner of the window. If you change your mind to change the color and design of important components, simply click on the "Cancel"button.